And that’s not Four Barrel’s only bone to pick with laptop-toting techies. Despite its location in the youthful Mission District just a mile from the offices of Twitter and Zynga, Four Barrel refuses to offer wi-fi. Why? Apparently it sees a coffee house full of people reading paper-back books and chatting with friends as more intimate than a sea of glazed eyes on MacBook Pros. As a resident of the Mission, that’s just fine by me. There’s plenty of places to hunker down and slug through email or bang out some code. 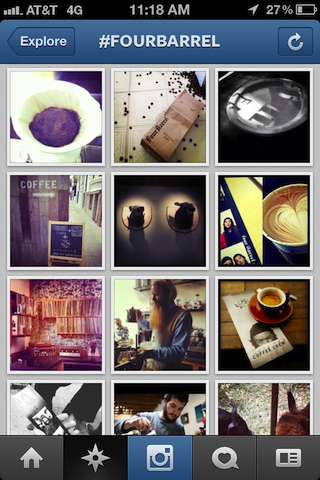 In fact, I think Four Barrel may just be at the forefront of a growing problem with our screen-addled society. Constantly transporting our consciousness elsewhere, we aren’t taking the time to stop and smell the roses, or in this case the Guatemalan coffee roast. But even the cafe’s obvious shunning of connectivity and camera apps can’t keep the computing at bay. The rules above are actually for the shop’s outdoor coffee stand Alley Barrel, but portable wi-fi hotspots and 4G phones ensure there’s plenty of web surfing inside Four Barrel’s main hub around the corner. Still, kudos for trying to create a tech-less sanctuary. So stop by Four Barrel for a cup, and live untethered in the moment for a moment. First discovered by SF’s Uptown Almanac.